The rainbow connection in Palermo Hollywood as seen from my apartment. 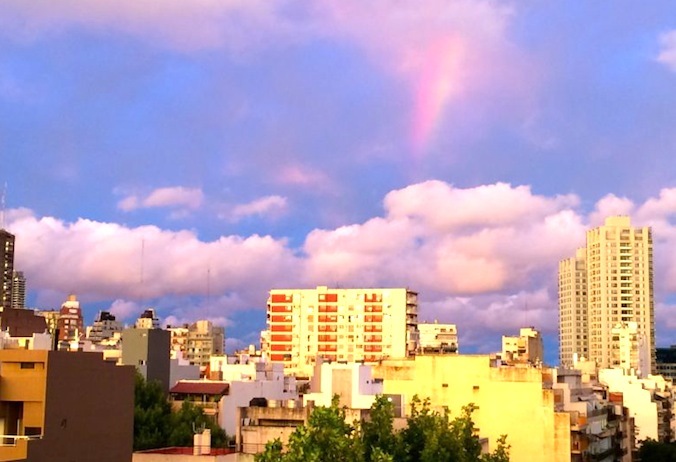 Whether you read local expat blogs or the Buenos Aires Herald as you try to grasp the city’s vibe, one thing becomes abundantly clear: the Palermo neighborhoods are the ultimate haps. We were lucky enough to score an apartment in Palermo Hollywood, home to cinema and media darlings, as well as an abundance of expats and a veritable world of killer dining and drinking options. You want a negroni, at a bar that specializes in negronis? Done. There’s a bar for that: the aptly named Negroni Bar. You want a vegetarian meal, an Indian meal, a Southeast Asian meal with extra spice? There’s Green Bamboo, Mumbai and Sudestada to tempt your tastebuds. A spot o’ soup at Sudestada, Palermo Hollywood. If shopping’s your jam, that’s no problem, either. The ultra-trendy Palermo Soho neighborhood is chock full of boutique shops carrying local designer wares, from art to clothes and jewelry. Day or night — and moreso, really late at night — the streets bustle with locals, expats and tourists grabbing a merienda (a happy hour equivalent to snacks and a drink), lingering over a monster steak at one of the area’s never-ending list of parillas, enjoying a cocktail or 3 and boardgames at a funky spot like Acabar, or lining up to enter one of the discotecas that thump into the wee hours of the morning. (Full disclosure: I am totally making assumptions with the wee hours of the morning thing, since I’m pretty much dead asleep at those hours, or if I am awake it’s probably to pee). Drinks at funky Acabar in Palermo Hollywood. So yeah, I’m thrilled to find myself in a neighborhood that’s much like the West Village of Buenos Aires, brimming with all manner of spaces that have paid particular attention to design and good vibes, or as the Porteños say, mucha onda. The downside? My pockets aren’t deep enough, my belly’s not big enough (though it’s certainly growing) and my wine tolerance not grand enough to entertain the innumerable restaurants, cafe and bars I’d love to visit. Sure beats what’s going on here……snow, snow, snow!!!! Your descriptive manner, the best travelogue ever!! !